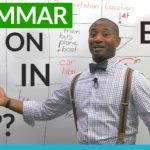 English for Beginners: Prepositions are short words that help us express location, time, and other relationships between people and things. Some examples of prepositions are: on, at, in, and by. Do you know how to use them? For example, do we say, „I am on a taxi“ or „in a taxi“? Do you like to travel „in a plane“ or „by plane“? After watching this simple but useful lesson, you will know exactly which preposition to use in any situation.